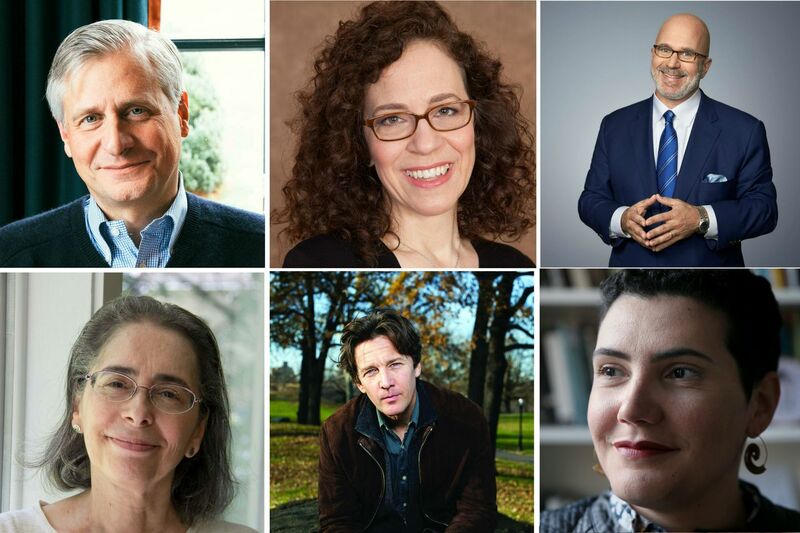 Authors coming to local venues this summer include (clockwise from upper left:) Jon Meacham, Janet Benton, Michael Smerconish, Raquel Salas Rivera, Andrew McCarthy, and Miriam Seidel. (Clockwise from upper left:) Heidi Ross; Steve Ladner; Courtesy of Temple University Press; Tim Tai/ Staff; Brian Harkin; and Hannah Greenstein. Bloomsday (11 a.m.-8 p.m. June 16, Rosenbach Museum and Library). On this day in 1904, Leopold Bloom walked the streets of Dublin in James Joyce's masterpiece, Ulysses. The Rosenbach Museum and Library hosts a daylong outdoor reading, featuring many Philadelphia celebs, plus music, food trucks, and a beer garden. (215-732-1600, rosenbach.org). Paul Offit, Bad Advice: Or Why Celebrities, Politicians, and Activists Aren't Your Best Source of Health Information (7:30 p.m. June 25, Free Library of Philadelphia). The title about says it all. The vaccine inventor, Penn professor, director of the Vaccine Education Center at CHOP, and science and health writer takes up arms against those who muck up our ways of learning the truth about health matters. (215-567-4341, freelibrary.org). Jon Meacham, The Soul of America: The Battle for Our Better Angels (7:30 p.m. July 12, Free Library of Philadelphia). Pulitzer Prize-winning historian and cable news pundit whose new book sees the political turmoil of 2018 in the light of other turbulent times in this country. (215-567-4341, freelibrary.org). Janet Benton (7:30 p.m. July 19, Open Book Bookstore). Author of the acclaimed novel Lili de Jong. (267-627-4888, openbookphilly.com). Gwen Florio, Silent Hearts (7 p.m. Aug. 1, Main Point Books). The former Inquirer reporter with her first standalone, literary novel. (484-580-6978, mainpointbooks.com).